In the above image, note the amount of money set aside for Social Security and Medicare and Health (Total = $92 billion), and then note the amount set aside for the Military and Veteran’s Benefits (Total = $695.7 Billion). And I, being a retired person, on social security and medicare (both of which I paid into), am supposed to believe that I and those like me are solely responsible for bankrupting this warmongering, pig-owned and operated government! Putting aside the unavoidable inference in his remarks the foundation for the Cold War—and the justification for the military-industrial complex ostensibly created to fight it—may have been premised on less than legitimate security concerns or noble ideals about freedom, democracy and the pursuit of happiness, given the widely unforeseen nature of the event he imagined, it is tempting to assume he knew something few others did. However, this was not the case. At the same time, whilst Kennan by his own admission had a struggle coming to terms with his prior ‘what-if’ musing about this putative unipolar world, he lived long enough to see the Great American War Machine “go on…”, albeit in a much changed—and for the majority of Americans, unexpected—form. As the U.S. entered this post Cold War era then—what Andrew Bacevich termed the Age of Great Expectations—most folks anticipated a ‘peace dividend’. But as history tells it, the much hyped and hoped for “peace dividend” revealed itself as a chimera, wishful thinking on the part of those people who’d breathed a sigh of belief at the disappearance of the Soviet threat. Of course we should recall here that most Americans and Russians amongst others expected a global “peace dividend” after 1945, which as history tells us it also failed to materialize. 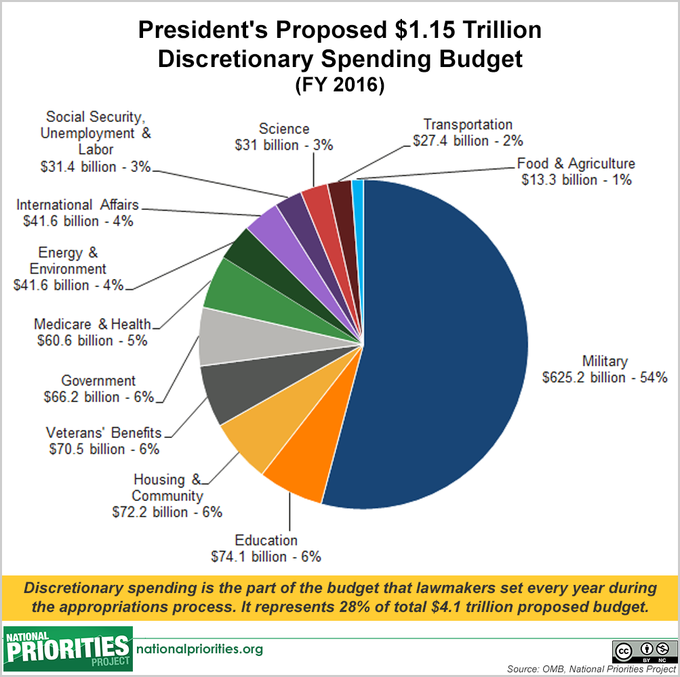 NOTE: Click link here to the above graphic regarding military spending. Readers are encouraged to watch this short animation to help visualize what one trillion dollars looks like. It’s an eye-opening exercise, providing perspective to spare. Do you have anything about Natasha McKenna on your website? If so would you point it out to me? Yes. I did try searching her name, before I asked. No, I do not. I am not familiar with her. Fill me in! https://youtu.be/jVs8B2Nmo5k No one was charged in her horrible death. She was a Mom. She WAS a Mother. https://en.wikipedia.org/wiki/Natasha_McKenna This is a very hard thing to watch. I watched my son for 40 minutes get CPR and chest compressions also. Yes, it okay to keep this post up. I have asked my powers that be to fire me yesterday. My forced silence is killing me. You need Facebook the see the full video and story, maybe a friend you know has Facebook. I have bookmarked this, and I will watch it. I have seen so many of these kinds of videos over the last few years, and they always enrage me, and they also make me physically ill. So to be honest, I will probably not watch every second of this woman’s murder by a ‘legal’ gang of male murderers. I was in a prison ministry years ago, when I was a practicing Christian, and I saw enough to know that this “JUSTICE” system is a complete lie. That experience was one reason I started blogging. And you know that most Americans would side with these gestapo agents! Thanks for bringing this to my attention. After I watch the video, I may post this as one more example of why this government needs to be done away with! Sorry to ruin your day, this video is disgusting. It was done in 2015. I just vented on the other comment, so I’ll just say that I am sickened by this, as I always am, when I see one of these murders take place. I’m surprised I missed this. I’m sorry you had to lose your job, but you are right to walk away from the tyranny. Any job that restricts our right to think and express ourselves is not a job worth having. But I also know that not having a job today, can be worrisome. So I hope you find employment soon! My employer is wonderful! It was a mutual decision, to take leave during this unfathomable situation. When this is resolved, my position is there to have back. I can not say here who they are, but they support, and they are huge organization themselves. I love my employer, my students……. However, I choose not to live in this country anymore. Why? Why stay in a country like this? That would be insane. Oh, I understand, Sorry for jumping to a wrong conclusion! Oh, if I had wings, how I would fly away! But my wings have been clipped! I hear you, believe me! And is that the real budget? Where is the allocation for interest payments on accumulated debt? Got me? I just know that the cost of waging war amounts to more than paying “we the people” back the money the state stole from us. As you know, I’d have to be a member of the cabal, or whatever it is, to be privy to the actual breakdown! I added the video to the post I published today. There is reblog button? Who knew? I cam reblog from this site and other sites. Just figured out how to make “them” listen. I think I need a hoodie like yours now. I’ve been blogging for eight years (this is my third and last blog), and I still find new things that I had no idea existed. I decided not to reblog this awesome blog on Jake’s site, I did not want people to think they were associated with Jake’s death. # not is the USA and # white people caused my son’s pain. BUT wow what a great wordpress site! PS. Can someone please send me a secure browser to use? I know for a fact IE is hacking my information. Is Mozzila safe? I have no idea. Hopefully someone else can suggest a safe one, and then I may follow suit. Don’t be concerned about that. I still find errors, no matter how much editing I do! Do you mind if I press this and publish it? Once again, I am so sorry that this was perpetrated on you and your son! I’m sending you an article I will be posting tomorrow. I would like to post yours with it! I will post this tomorrow! PERFECT I LOVE MESSING UP PEOPLE ON THE WEEKENDS LIKE THEY DID TO ME AND JAKE AND WAITED UNTIL MONDAY! It will be up tomorrow, along with the other article I sent you. Needless to say they both go hand in hand! This is why what you are sharing is so important! People need to hear from the victims of this industry more than they need to hear from experts exposing it! I updated my post to include what you added! My internet is suddenly crashing today, hard to communicate. I’ll probably be off line for most of the rest of today. Good Day has 2 blog spots! I just saw your posts. First, I used the photo of your son for the image on my post. The photo breaks my heart. Second, the google notice could be a glitch. Or it could be they are messing with you. But if google is messing with you, then I am on their hit list as well!